This is the season of absolutes, a time for reflecting and rendering judgment. Has it been a year to remember or a year to forget? Are we on the right path, or hopelessly lost? The truth is usually somewhere in the middle, but that doesn’t make provocative copy, and so it is often ignored. While some voices in North Carolina would have you believe that we have finally put the Great Recession in the rear-view mirror, the economic damage lingers. As the two charts below show, a year of generally positive economic performance has not erased the imprint that the Recession left on North Carolina. 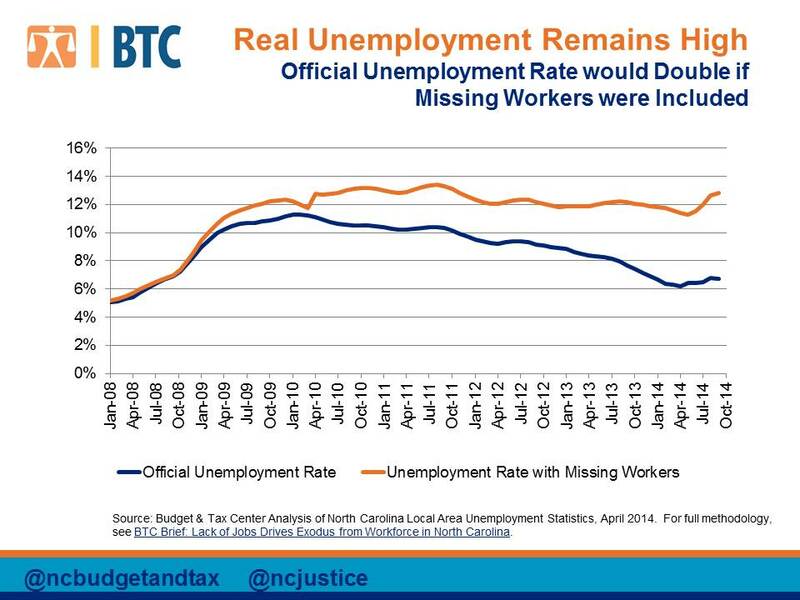 There is still a larger percentage of North Carolinians without employment than before the Great Recession. From the start of the millennium through 2007, more than 62% of North Carolinians had participated in the workforce each year. That rate dropped precipitously in 2008, and kept sliding until it hit a low of roughly 58% in 2011. 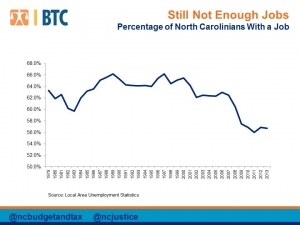 While there have been modest gains in the last few years, the labor market in North Carolina still has not recovered sufficiently to return employment levels to where they were before the financial crisis. Proponents of the “Carolina Comeback” story point to the fact that North Carolina’s headline unemployment rate has come down over the last year, so what’s the worry? The problem is that many people have such a hard time finding work that they don’t appear as “unemployed” in the official figures. A BTC analysis of labor data indicates that the real unemployment rate is twice the official level once we consider all of the people who are not currently looking for work because job opportunities are too few. To be clear, this is not a tally of people who have retired or gone back to school, but rather an estimate of what the unemployment rate would be if we include all of the people who would otherwise be expected to be in the labor force based on historic figures. 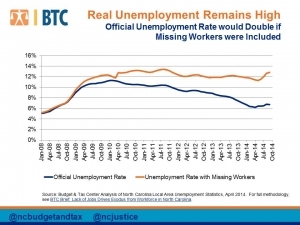 Including these missing workers pushes North Carolina’s real unemployment rate to almost 13%, twice the official estimate. The central point here is that we cannot lose sight of the work that still remains to be done. 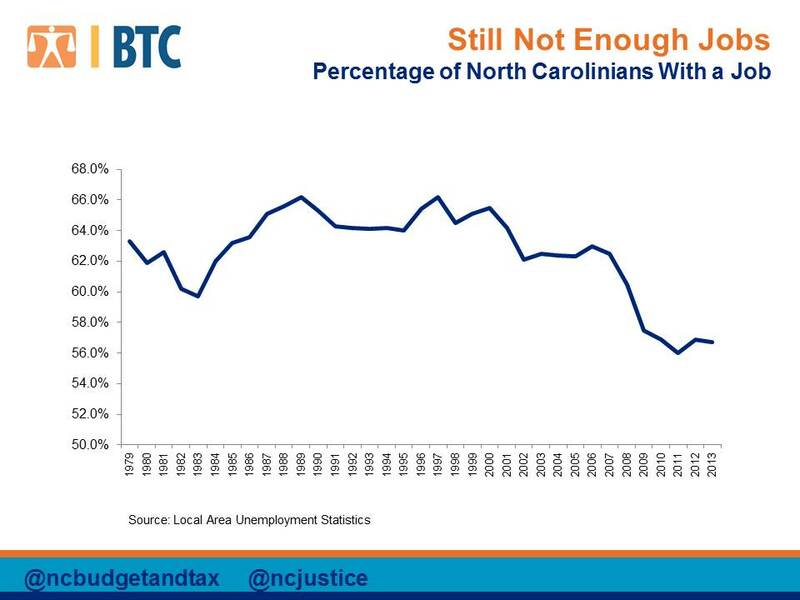 While there has been a good deal of encouraging economic news this year, there are still far too many North Carolinians for whom the recovery remains a promise unfulfilled. Stay tuned over the next several days for a series of BTC posts that illuminate the 2014 economic landscape and the challenges that need to be addressed in 2015. The official unemployment rate ticked down in September slightly to 6.7 percent but if you count the number of workers missing from the labor force–those who would be looking for work if employment opportunities were stronger–that rate would be 12.8 percent. As Patrick Conway, an economist at UNC Chapel Hill, shared in the News & Observer this week, the untold story of the state’s labor market is the story of these missing workers and the inefficiency in the economy that must be addressed when the state does not ensure those who want to work have job opportunities. The official unemployment rate ticked up in August to 6.8 percent but if you count those missing workers who would be in the labor market if job opportunities were stronger that rate would be 12. 6 percent. 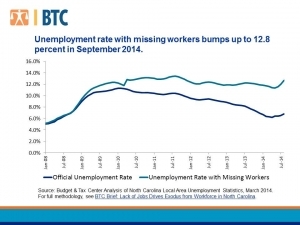 Our update to the number of missing workers in North Carolina reflects the ongoing challenge for workers when there are too few jobs for those who want to work. It also demonstrates the failure of the unemployment rate alone to tell the story of what is happening in the state’s labor market. the state level is calculated based on expected labor force participation rates while accounting for demographic trends like an aging population. As an indicator, the number of missing workers and an unemployment rate that accounts for them provides information about how far the current labor market is from meeting all the needs of workers in the economy. 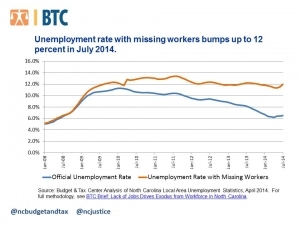 North Carolina’s recovery will continue to struggle to deliver benefits broadly as long as so many workers remain missing from the labor force because there are too few jobs. Yesterday’s release of the latest labor market numbers for July 2014 continues to show a slow recovery of jobs in North Carolina. Job growth, while occurring, is insufficient to ensure that the state’s growing working age population has employment opportunities. North Carolina has still not replaced the nearly 300,000 jobs lost during the Great Recession. In fact, the state’s job creation over the year (2.1 percent) is not significantly different than that for the nation (1.9 percent) over the same period. The state’s jobs deficit also remains high at 470,000, and at the current annual rate of job creation will require five years to close. 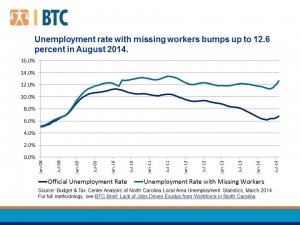 In this context, here is the missing workers update for July 2014: there still remain more than 256,000 North Carolinians who are missing from the labor force. These are folks who would be seeking employment if job opportunities were stronger. If these workers were counted in the unemployment rate, that rate would be 12 percent rather than the official unemployment rate for July 2014 of 6.5 percent. Last week the Bureau of Labor Statistics and the NC Division of Employment Security released data on the state of North Carolina’s labor market. While the decline in the official unemployment rate may have generated headlines, the reality is the labor market continues to provide too few job opportunities for those who seek work. The number of missing workers, which estimates who would be in the labor market if job opportunities were stronger, provides additional insight into the state of North Carolina’s labor market. 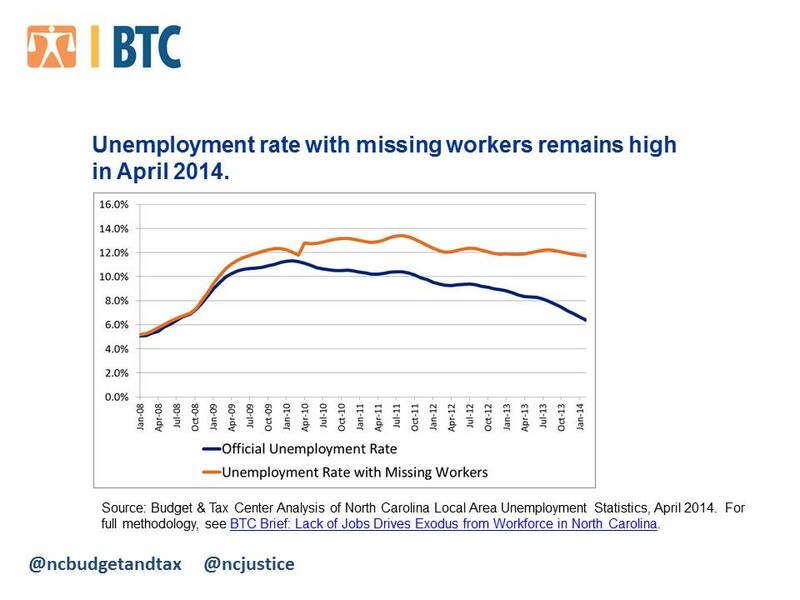 As of April 2014, there are an estimated 242,164 missing workers in North Carolina. Again, these are North Carolinians who would be seeking work if jobs were available. If these workers were included in the official unemployment rate that rate would be nearly twice the official unemployment rate: 11.4 percent rather than 6.2 percent.